In medium bowl, stir together cream cheese and mayonnaise. Stir in artichokes, bell pepper and jalapeños. Reserve 1 tablespoon of the cheese; stir remaining cheese into artichoke mixture. Spread cheese mixture evenly in bottom of pie plate. 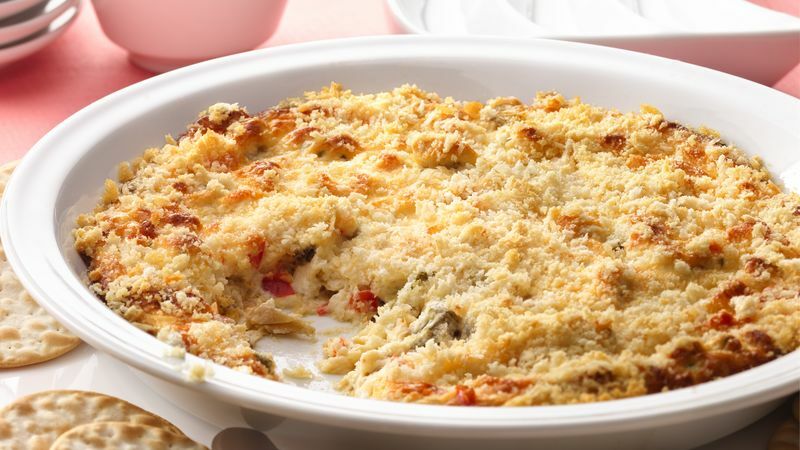 Sprinkle evenly with bread crumbs and reserved tablespoon cheese. Bake about 20 minutes or just until top is lightly golden. Serve warm with crackers. For a dip that's less spicy, try with fewer jalapeños slices or substitute 2 tablespoons Old El Paso® chopped green chiles for the jalapeños. Panko bread crumbs are Japanese-style bread crumbs that are bigger and crispier than regular bread crumbs.